My new book with Prof. Paul Frijters about the grey corruption Game in Australia has been officially released today. It explains how the Game of grey corruption is played, how much it costs us, and what to do about it. In this book you get a much deeper and more comprehensive look at how networks of favouritism form, whether legal or illegal; a view that is informed by our own academic research and that of many others. We also use new economic analysis to show how much the Game costs across some of Australia's major industries, and discuss how we can transform from our current system, to world's best, in each sector. Read Michael Pascoe's terrific article reporting the arguments in the book, and my proposals in my submission to the CCC inquiry into developer donations to councils. 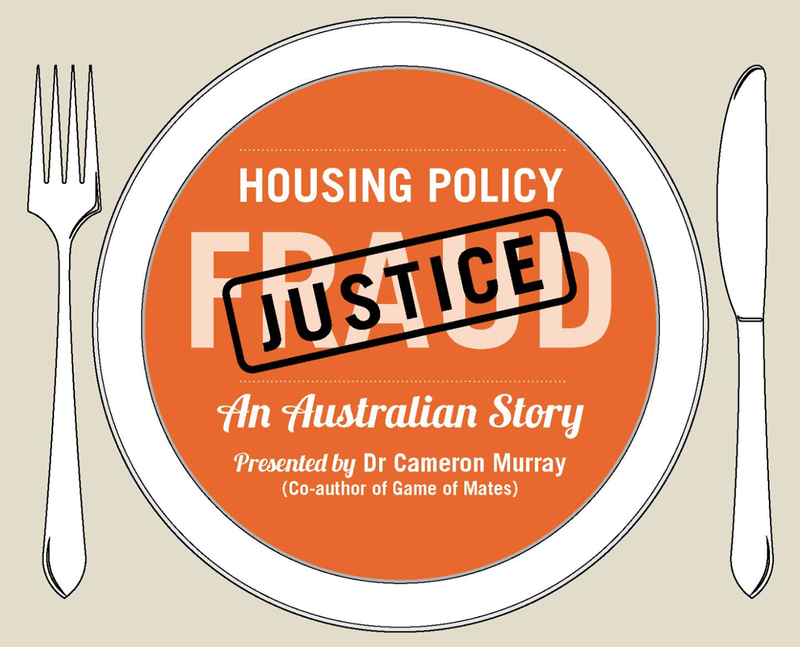 This book will open your eyes to how Australia really works. It’s not good news, but you need to know it. Australians pride themselves on their egalitarianism. But that’s wearing thin. Murray and Frijters are both highly trained dispassionate scholars but their conclusions will shock you. Or I hope they will. If their calculations are even half right you’ll be shocked at how far the Mates have their hand in your pocket! While we are distracted by mythical battles in the Game of Thrones, we are being robbed in the real world “Game of Mates” where the well-connected clip the wages and profits of the hard working. 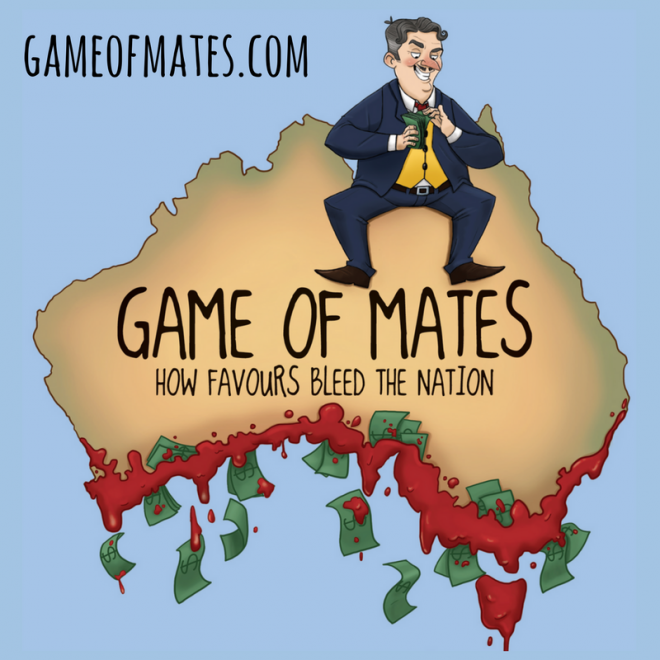 Murray and Frijters provide an entertaining and well researched expose of how privilege and rent-seeking dominates the Australian economy, enriching the Mates in the Game while robbing the rest. And they propose how to end the Game. And they name real names too. This is an explosive and essential book for all Australians. Except the Mates. If you want to understand what is going in the corridors of power in Australia and how a deep network of insiders are using governments to line their pockets you need to read this book. In my own area of urban planning, the richly documented cases described in the book clearly show how potential public benefit and potential revenue is being siphoned off into arms of selected members of the development industry. Governments need to held accountable for these processes. This book will help Australians understand what is going on – its describes how a small but powerful group of insiders have their noses in the public trough in a range of industries. James is our most mundane villain. His victim is Bruce, our typical Aussie, who bleeds from the hip pocket because of James’ actions. Game of Mates tells a tale of economic theft across major sectors of Australia’s economy, showing how James and his group of well-connected Mates siphon off billions from the economy to line their own pockets. In property, mining, transport, banking, superannuation, and many more sectors, James and his Mates cooperate to steal huge chunks of the economic pie for themselves. If you want to know how much this costs the nation, how it is done, and what we can do about, Game of Mates is the book for you. What if I told you..? Or in store at Avid Reader (Brisbane), Gleebooks (Sydney), Books of Buderim (Sunshine Coast). I'm part way through your book (paperback copy bought through Book Depository). A couple of comments may be of use to you. 1. I cannot understand the ratios argument in chapter 2; shouldn't you be analysing land development cost issues rather than comparing median prices of the total housing stock (which surely encompasses both new builds and pre-existing stock). 2. I hope that you are working hard on a revised edition. I identified a number of typos, spelling errors and incorrect matching of dates of references in the first few pages. You also need a skilled wordsmith to work the whole text over, as much of the grammar is less than perfect. Your book needs to seen as a standard reference; tightening up the style of language that you use is essential if you wish to avoid confusing the better educated reader. Thanks for the comments. And thanks for reading the book. 1. The 70% of gains to James comes from my study showing that connected developers got $410m of the $710m of value created by in the rezoning decisions I studied. 2. Yes I know this. Think of it as 'authentic'! But yes, there is a long story to why we self-published, and the degree of editing that went into it. The trade-off was timeliness. I should update it quickly shouldn't I? Do economists even know what firms do?